EK Success CUTTING MAT Self Healing 13 x 13 inch 54-06004 at Simon Says STAMP! Success, EK Success CUTTING MAT Self Healing 13 x 13 inch 54-06004 has been shared! This 13 inch square self-healing cutting mat from EK Success is the perfect addition to your craft tool kit. It is ideal for 12 x 12 inch paper and has both inch and metric measurements on all four sides. Other features include: - 1/4 inch grid lines for easy alignment - Quick cutting guides for common dimensions- Self-healing vinyl closes immediately when cut, unlike glass that might retain cut marks Dimensions: 13 x 13 inches. 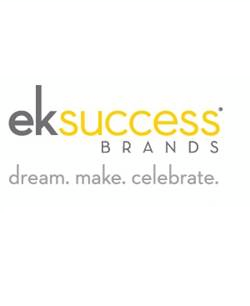 EK Success Brands is a creative consumer products company focused on producing innovative products under brands you know and trust. From scrapbooking, stamping and paper crafting to jewelry making, needlecrafts, and kids' crafts, their products will inspire you to celebrate everyday life!